In How the Leopard got his Spots by Rudyard Kipling we have the theme of necessity, fear, appearance, conflict, change and trust. Taken from his Just So Stories collection the reader realises after reading the story that Kipling may be exploring the theme of necessity. Best Beloved (or Spots) and Sambo are driven to despair because of their inability to hunt for food. The giraffes and the zebras have tired of not being able to hide themselves form Spots and Sambo and as such the food has dried up on the High Veldt. Forcing both to go in search for food elsewhere. What is interesting about this is the fact that that when both Socks and the Sambo try to find game on the lower grounds. They cannot due to the change in appearance of both the giraffes and the zebras. It is possible that Kipling is suggesting (and advocating) for animals to live in an environment in where their colour acts as camouflage. Making it difficult for Spots and Sambo to capture them. There is also an element of fear among the giraffes and the zebras while they are living on the High Veldt. It is as though they are too easy to capture and they know it. With self-preservation in mind they begin to descend to lower ground. Where they cannot be caught as easily. It is only when Spots and Sambo can no longer find food and with the help of the Baviaan’s advice do they decide to hunt on the lower grounds. They also follow the Baviaan’s advice of changing their appearance in order that they can sneak up on their prey (giraffes and zebras). Regardless of the changing of both Spots and Sambo there still remains an element of conflict in the story. No animal wishes to die at the hands of another animal or at the hands of a man. However the law of the jungle suggests that only the fittest will survive and there is no doubting that Spots and Sambo have the advantage there. Both Spots and Sambo are the most powerful enemy for the giraffes and the zebras. What is also interesting about the story is the fact that neither Spots nor Sambo feel any guilt over their actions. For them they must feed themselves and the giraffes and zebras are the perfect food. That is should other men come along and consider Spots to be the perfect meal. Something that does not dawn on Spots. He is in complete compliance with Sambo as though both were friends. When the reality may be they have one interest in common and that is to capture and kill giraffes and zebras. Life can be fickle and there is also the possibility that Sambo will turn on Spots. Something that Spots himself has never thought about as he trusts Sambo. In fact Spots relationship with Sambo appears to be based solely on the food they can both manage to kill. It doesn’t seem as though Spots himself thinks he will be ever killed by Sambo. The giraffes and zebras exile from the High Veldt has also been fruitful with none of the animals having to risk being killed by Spots or Sambo If anything they are living a peaceful life without the previous worries that they had when it came to Spots and Sambo. The end of the story is also interesting as Spots develops spots on his skin while Sambo prefers for his skin to be all black. This may be important as both men do not change their outlook on life. All that has changed is the colouring of their skin. They still want to catch and kill giraffes and zebras. Which may highlight the mentality of not only Spots but Sambo in particular. Man at times has been the bane of an animal’s life. Often killing animals for food, when there are alternatives, and often killing for sport. Sambo is no different than he was when he was living on the High Veldt. He is still a man who has changed only in colour and remains an enemy to those living on lower ground. Similarly Spots still wants to hunt the giraffes and zebras which may leave some readers to suspect that Spots has not learnt anything. He foolishly trusts Sambo and the reader feels as though the trust is not reciprocated. In time Spots may fall prey to Sambo who might not be able to hunt the giraffes or zebras or who gets bored of eating the same meat all the time. McManus, Dermot. 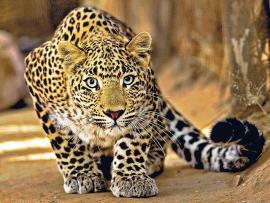 "How the Leopard got his Spots by Rudyard Kipling." The Sitting Bee. The Sitting Bee, 12 Apr. 2019. Web.